Dress to be debonair with this handsome backless vest. Crafted from 100% wool and accented in satin at the collar, the faux besom pockets, and the front buttons, its style is timeless and its quality is easily apparent. Perfect for wearing to formal or black-tie events, this staple of men's formal fashion will serve you well for years to come. Includes a matching, pre-tied black satin bow tie. PURE SOPHISTICATION AND GRACE. With a low cut front and sleek shawl collar, this stunning backless vest will looks so elegant when paired with formal shirt and tuxedo. MADE FROM 100% WOOL. Known for looking wonderful and wearing well, wool is the favored material of high quality formal garments. The wool used for this vest does not disappoint. BEAUTIFULLY ACCENTED. Black satin accents grace the collar, the two besom faux pockets, and the three front buttons for the perfect touch of shine. ADJUSTABLE FIT. 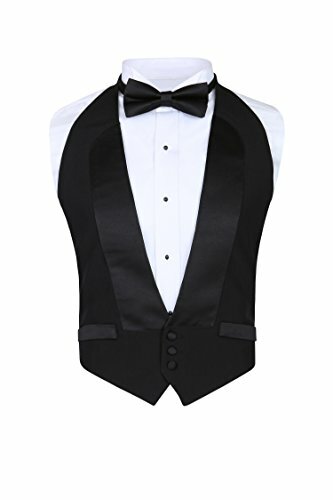 Both the vest waist and the bow tie can be adjusted, ensuring the best fit possible. COMPLEMENTARY BOW TIE. Pre-tied for convenience and ease of wear, the satin bow tie is a perfect match for the vest, sparing the hassle of trying to find a match elsewhere.